Delores M. Overskei, age 89, of Madison, went to be with her Lord, Monday, November 19, 2018. Funeral services will be 1:30 PM, Saturday, November 24, 2018, at Grace Lutheran Church in Nunda. Burial will follow at Prairie Queen Cemetery at Nunda. The family will be present fro visitation from 5-7 PM, Friday, at the Ellsworth Funeral Home in Madison. Delores Mae Bickett was born August 27, 1929, to Frank R. and Marie N. (Rosenberry) Bickett on a farm in Miner County. She attended country grade school and graduated from Madison High School in 1947. Delores married Lyman Russell Overskei on July 19, 1951. In 1953, they moved to their farm near Nunda. 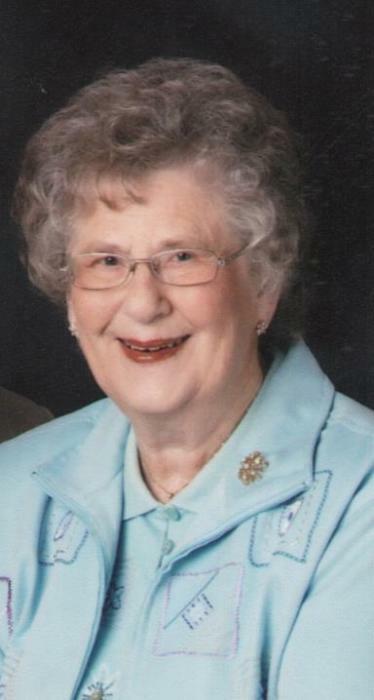 Throughout her life, Delores was an active member of St. John Lutheran Church at Ramona, Prairie Queen Lutheran Church, Nunda Lutheran Church, and Grace Lutheran Church, all at Nunda. She enjoyed genealogy research, Entre Nous, Go 4 Fun, embroidery, gardening, canning, and baking. She especially enjoyed her church and her family. Survivors include her husband of 67 years, Lyman “Skip” Overskei of Madison; one son, Joel ( Donna) Overskei of Nunda; 4 grandchildren; and 9 great-grandchildren. She was preceded in death by her parents; and two sisters, Jean Michelke and Frankie Walker.